Dubai’s iconic luxury apartment skyscraper ‘The Marina Torch’ was engulfed in flames on Saturday. 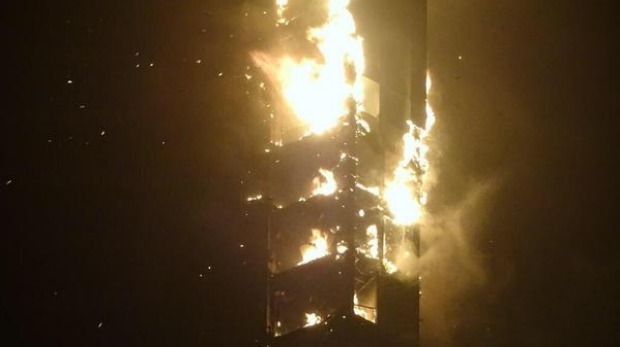 Fire erupted in 50th Floor of the 330- meter long building, scattering fire debris from two sides as witnesses say. Hundreds of residents were evacuated from the nearby buildings as a precautionary measure. The Dubai civil defense told that no casualties or deaths were reported. Emergency crew and investigators are on the scene searching for clues to the incident. ‘Strong currents of wind fuelled fire to spread over the floors, we were out in the streets enjoying our weekend’ witnesses said. Falling fire debris escalated fire rapidly to other parts. The Torch was commissioned in 2011 a 79 floor luxury apartment with 675 residential piece, 6 retail areas with 24 hour security by Select Group, a renowned building developer. Authorities said that firefighters rushed to the scene and dossed fire is now under control. Next: New Star Sports ad for India versus UAE match. Wait & see who gets the ‘Mauka’ this time?